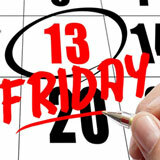 There's a Friday the 13th this month and Springbok Casino is turning the supersticious day into the luckiest day of the month by giving South African casino players a R1300 Friday the 13th Casino Bonus. This is a free bonus! If you make a minimum deposit this week you can claim the 1300 rand bonus on Friday. You can win up to R2500 with your free bonus cash. Once you're made your qualifying deposit, claim your free bonus with coupon code FRIDAY13-2017 January 13th to 15th. All players that have made a deposit in January can claim free bonus. Springbok Casino has hundreds of slots and table games from Realtime Gaming. The South African online casino and mobile casino provides customer service in both English and Afrikaans. The new Sweet 16 slot from Realtime Gaming has been the most popular since it launched just before Christmas. Sweet 16 features RTG’s new Morphing Symbols feature where symbols in any winning combination change into new symbols to create another winning combination. With each successive win, the prize is multiplied by more – up to 10X the win. Three or more Lollypops start 16 Free Games with multipliers up to 20X. Like many of its most popular games, Sweet 16 is also available in Springbok’s mobile casino.